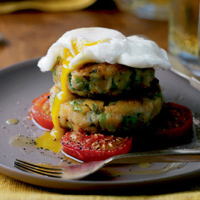 The sweet potato and cheese in these bubble and squeak patties complement each other perfectly and make a great supper dish. Remove the cabbage, drain and set aside. Drain the potatoes in a colander then return them to the pan. Add the butter then season and mash until smooth. Mix in the salad onions, cheese, rosemary and the cooked cabbage. Combine well then leave to cool. Divide the mixture into 8. Dust the worktop and your hands with the flour, then form the mixture into small, round patties about 2cm thick. Place in the fridge for 10-15 minutes to chill. These patties can be made by adding any leftover cooked vegetables to the mash. Simply combine and cook. Organic lager is crisp and refreshing.